"Many Christians have what we might call a "cultural holiness". They adapt to the character and behavior pattern of Christians around them. As the Christian culture around them is more or less holy, so these Christians are more or less holy. But God has not called us to be like those around us. He has called us to be like himself. 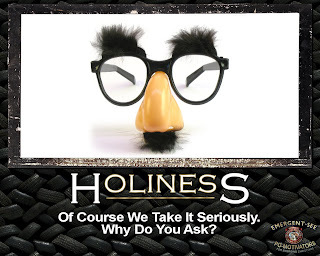 Holiness is nothing less than conformity to the character of God." Just as culture can and will trump vision, it can also (and will) trump holiness... this is a great nugget! hmmm, good stuff! Good stuff!